On July 15, I headed to Paso Robles in a truck and trailer for a 15-hour round-trip rescue of a badly burned steer named Panda. Everyone knows his story by now. A year ago, someone entered Paso Robles High School, doused five-month-old Panda with gasoline, and set him on fire. He was left for dead. He suffered burns over 50 percent of his body. Garrett Kaplan allegedly did this to Panda, and nobody knows why. The District Attorney brought felony animal cruelty charges against him, and the judge ordered a psychological evaluation. While Kaplan was arrested, the student raising Panda for a Future Farmers of America project remained committed to walking the trusting steer to slaughter at the Mid State County Fair. This, despite multiple offers of sanctuary for Panda. Panda was the victim of two crimes – malicious cruelty, and the ultimate betrayal from the one person he trusted. Panda happily ended up at our sanctuary, Animal Place, located on 600-acres in the Sierra foothills. The student only valued Panda's flesh, while his rescuers valued Panda as a unique individual who deserved to be free of suffering. It took the generosity of one special person to save Panda's life. Marcy Christmas paid the high school student $10,000 for Panda – three to four times the amount he would have received at the auction. Marcy saw a living being deserving of sanctuary, not a product to be walked into the terminal auction ring. Panda is now surrounded by a herd, a novelty after a year without the company of other cows. Instead of a small enclosure, he roams acres of woodland with his own kind. His value is not in his flesh but in his unique personality and desire to live. Panda is covered in scars that will never completely heal. Both of his ears are mutilated, one melted off. He may have hearing loss and blindness in one eye later in life because of this early trauma. 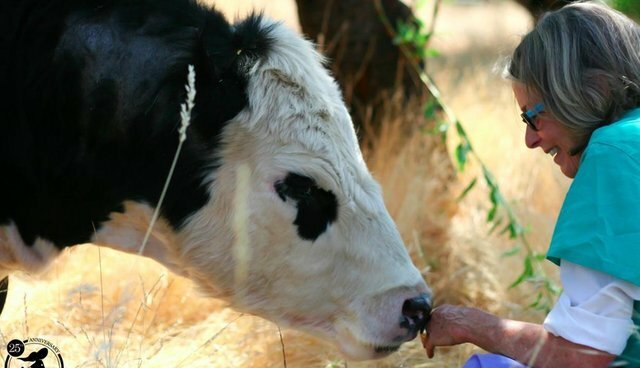 While the cruelty Panda suffered was egregious, and the community of Paso Robles rallied behind him in his recovery, he is only one of thousands of animals nurtured, loved, and named by students as part of 4H and FFA. At the Mid-State Fair, 771 other animals were less fortunate than Panda. Many left the auction headed straight for slaughter. The auction brought in nearly $2 million dollars in sales. Children are encouraged to treat each animal with respect, to gain their trust, only to betray that bond by selling that animal for price per pound. As one of the nation's oldest and largest farmed animal sanctuaries, we are very familiar with student agricultural programs like FFA and 4H, and have rescued many former victims of these programs. Unfortunately we find that FFA and 4H do not teach kindness or compassion for animals, or encourage young people to consider the best interest of the animals. We have seen even very young children recognize their betrayal. It stares these children in the face, smiles, wraps its greedy hands around their small shoulders and says, this death, this slaughter, this is okay. For months, children have fed, watered, groomed, handled, socialized and, dare I say it, loved these animals. They have gazed into blameless eyes, have nursed them to health, and when it comes time for the fair, for the inevitable auction, children weep for their beloved friends, they cry tears of pain and anger that this animal who they have devoted heart and soul to is slated for death. We all want children to learn how to be responsible – that is not in question. My concern is what the animal-rearing projects of 4H and FFA are teaching kids. Does "responsibility" include killing an animal you've named, socialized, nurtured? If we replaced "cow" with "dog," would our feelings change? Teaching children compassion and justice is vital to creating engaged adults. Needlessly killing animals doesn't seem like the best education we can offer. We should be encouraging critical thinking, embracing experiences of empathy and compassion, not squelching these qualities by teaching impressionable children that it's okay to love someone fiercely, protect them, care for them, and then kill them.